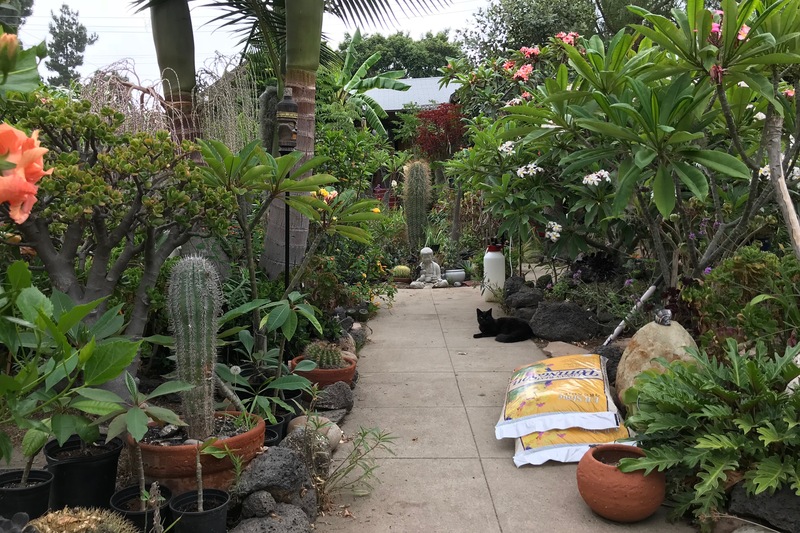 For about five years, delight of the neighborhood—down Maryland Ave. about halfway between border streets Madison and Lincoln—is a mini-wildlife refuge that I affectionately call the Butterfly House. The name derives from the Monarchs and other flying things that frequent flowers and foliage there. 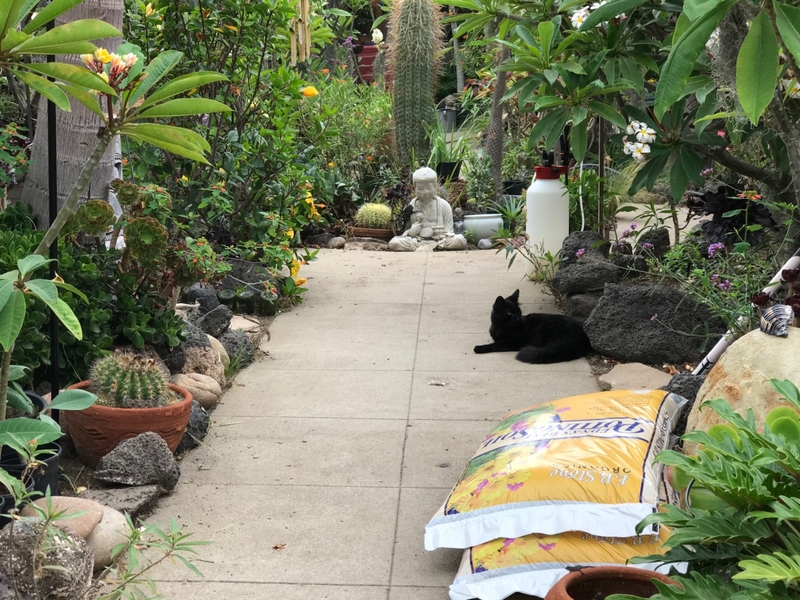 This series has featured felines—nicknamed Flower and Skull—on either side of the property, but not until today did I see, for the first time (finally), and photograph a kitty there. Of course, my wife and I would be walking to The Hub for groceries without a camera other than iPhone 7 Plus. The Featured Image pulls back from the furball to provide some sense of the lush greenery and their variety. Vitals: f/1.8, ISO 20, 1/523 sec, 3.99mm; 9:36 a.m. PDT. San Diego’s typical early day marine cloud layer made for perfect shooting conditions. The second photo puts more attention on the cat, whom I call Wink. From a distance, the beastie appears to have some problem with her left eye—possibly infection or perhaps some other irritation. But she continuously closed her eyelid—hence the nickname. For this portrait, I used the smartphone’s second camera to get 2X optical zoom. Vitals: f/2.8, ISO 20, 1/191 sec, 6.6mm. Both pics are slightly straightened but otherwise not retouched. Felines you shouldn’t miss: Scruffy, Roly Poly, Woo, Skull, Biscuit, The Colonel, White, Chipper, Frisky, Stretch, Needy, Farfisa, Mates, Hunter, Pee-Pee, Blue, Blue Too, Bonded Pair, Patience, Fess, Jumper, Frenemy, Looker, Cozy, Scout, Lurks, Skit, Mini, Betty, Black and White, Stalker, Bell, Chill, Sammy, Scratch, Poser, Star, Grey and White, Watcher, Herman, Comet, Roman, Willow, Chub, Nimbus, Watson, Lilo, Kit, Pepe, Twilight, Sebastian, Spot, Booger, Ash, Veruca, Riley, Mellow, Bonde, Flower, Glass, Black, BeBe, Fang, Bruce, Siamese, Pounce, Tortie, Haiku, Fraidy, Peso, Daniel Tiger, Dusk, Stride, Dainty, Spry, Tabby, Betty Too, Still, Levi, Shadow, and Sophie.